It is one of those historical ironies of the sport that Duke is heading home because the refs didn’t call many fouls on them. Usually, the free-throw disparity—the Blue Devils took 13 to Michigan State’s six—and perceived favoritism works in Duke’s favor. 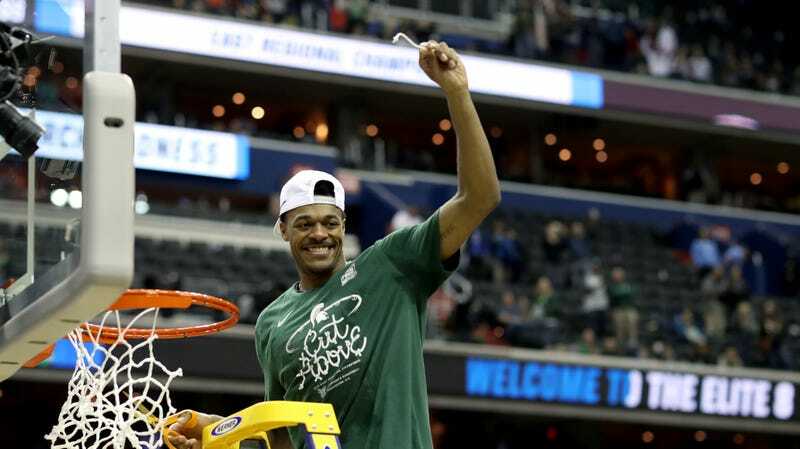 But not on Sunday, not in the closing seconds of the Spartans’ 68-67 Elite Eight win, when Duke would have given anything to have been whistled a couple more times. No conspiracy here, just relatively disciplined Duke defense and a set of officials that swallowed their whistles for both teams (if anything, Michigan State could’ve been penalized more often for bodying Zion Williamson nearly every time he drove to the basket). However it happened, the Blue Devils had racked up just three fouls in the second half before R.J. Barrett missed a free throw—then accidentally made another—that would have tied the game with 5.2 seconds left. That meant that intentionally fouling did not send MSU to the line and give the Blue Devils back the ball; all it did was set up an inbounds play for a trip to the Final Four. Before Xavier Tillman inbounded the ball, he gave Cassius Winston a glance. Oh, hell, might as well capitalize it. The Glance. A lot can be conveyed in a nod, a raised brow. Cassius Winston broke back toward the baseline, shedding Tre Jones, bumped R.J. Barrett, then broke free and broke upcourt. Once Winston had the ball in his hands—and once he wisely dribbled to the corner instead of going for a quick bucket—the game was over. Why didn’t Duke foul Winston? It wouldn’t have done any good. They were still three fouls short of the bonus.